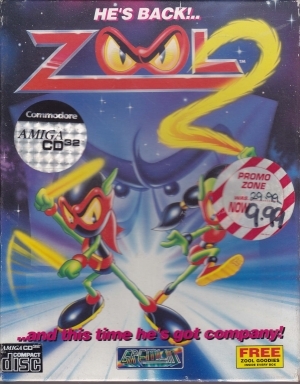 Zool, and his fabulous female companion,Zooz, are about to face a challenge which would wilt the knees of even the toughest Ninja in this action packed platform action arcade sequel.You'll need joystick skills from the NTH DIMENSION when you help them take on the evil Krool and his devious accomplice Mental Block as they seek to wipe imagination from the face of existence. Can you imagine pitting your wits against such a duo across 6 fantastic levels of major league mayhem? And what about Zoon, their two headed pet alien dog. Try talking to the wrong end of this cosmic canine catastrophe and 'walkies' will take on a whole new dimension. * 6 huge levels supercharged with varied and challenging gameplay. 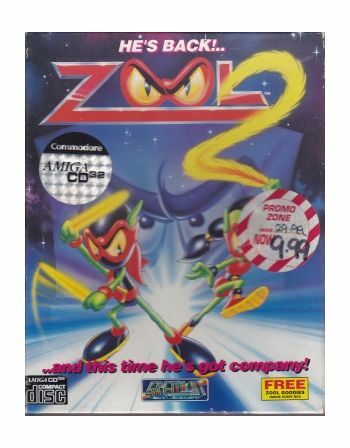 * Play either Zool or the fabulous Zooz, each with their own special strengths and moves. * A nerve jangling collection of cunning enemies and monsters. * Essential and varied power ups and collectibles.